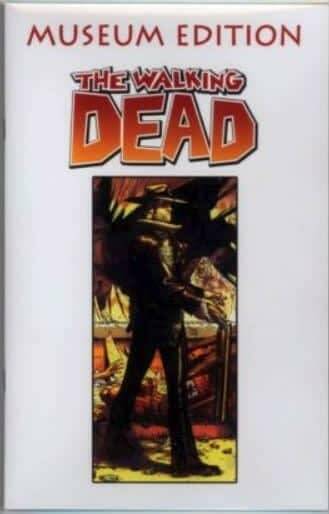 There is no ‘Museum Edition’ of The Walking Dead #1, the first-issue of the long-running series of the zombie apocalypse comic book that has spawned two TV series, games, and all the merchandise you can eat. But some people didn’t guess the memo. 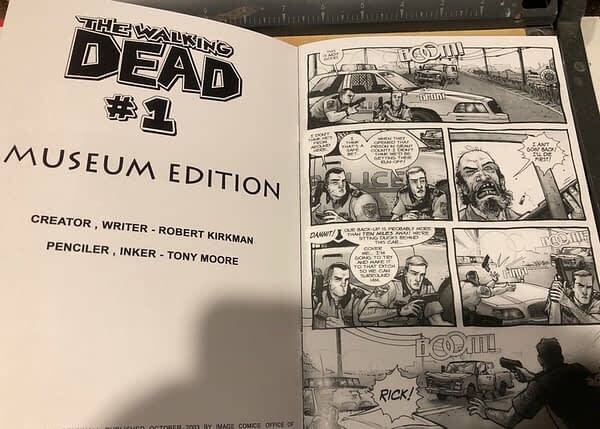 A ‘Museum Edition’ version of The Walking Dead #1 was made shortly after the original comic came out as part of a promotion for the Fear Fest Horror Con around mid-Ohio in 2004. However, due to slow vendor sales, the con was cancelled. After that, the comic books were kept in storage for about a decade before resurfacing again. The intent was to give the comics to the top tier ticket buyers in their ticket package. Gold stickers were made that were going to be applied on the back cover above the numbering that showed the Fear Fest Horror Con name along with the promotion company’s name on it; however, since the con was cancelled, the stickers were never affixed and are now long gone. This comic has a prestige cover printed by Quebecor and is limited to 100 copies; most of which still have not been released into circulation making it one of the rarest Walking Dead books in existence. The inside is black and white and printed on a high-quality paper. Each comic is hand-numbered. However, Skybound Entertainment has confirmed that this edition of The Walking Dead was never produced. 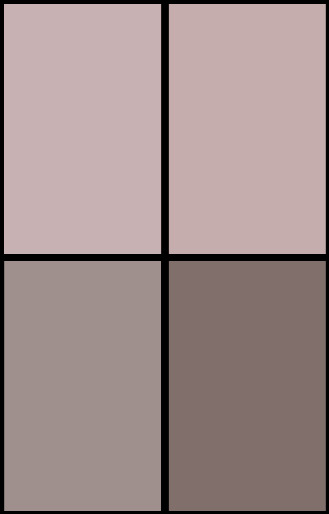 Not by Image or Skybound, anyway. Instead, it appears to be a counterfeit version of the comic book. 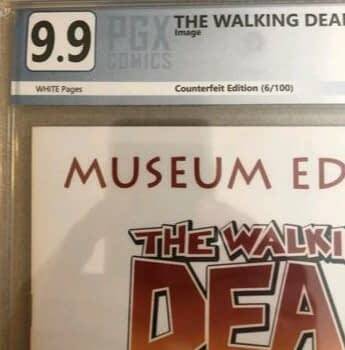 Bleeding Cool reader Rick Trajano points out that, to add authenticity, copies have been graded and slabbed by comics grading company PGX and sold on eBay, fetching up to $3500. Although other copies have sold for less, they have still sold for thousands. And each one, each graded by PGX, is a fake. Just a fake in a really good condition. Copies were being sold slabbed by Wonder Tunes Comics of Kenosha, Wisconsin and raw for $350 by on eBay by nesman201. 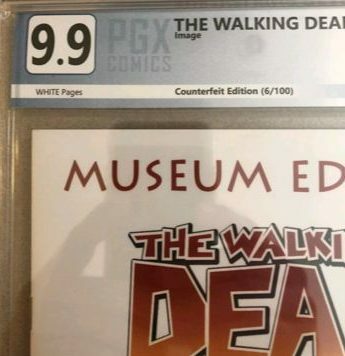 It appears to be a poorly printed copy of The Walking Dead #1 with a slightly-too-large card cover and nothing like the over-the-top production values of the classics ‘Museum Edition’ comics created as high-end collectables. We are aware of this and I appreciate you emailing us about it. We are no longer grading that book. We are still looking into this so I don’t have a whole lot to offer as far as information right now. It looks like they continued grading the book after all. But with one addition. That is, at least, honest.